The novel Accelerator Science and Engineering Traineeship (ASET) program curriculum consists of courses, practical training at the Facility for Rare Isotope Beams and National Superconducting Cyclotron Laboratory at MSU and at U.S. Department of Energy (DOE) national laboratories, and thesis requirements. Topics such as project management and radiation safety are also covered in the curriculum. Existing colloquia with regular ASET content and monthly "Accelerator Science Forum" talks will familiarize the students with a broad range of ASET topics in the core areas where there are critical workforce needs. The full curriculum is outlined in the below table. Students will be trained at MSU facilities including FRIB/NSCL (centrally located on campus), the Department of Physics and Astronomy, College of Engineering departments and the U.S. Particle Accelerator School. Additionally, students will attend at least two conferences or workshops and complete a thesis meeting their home department requirements. Upon completion of the program, students will receive ASET certification, and will be specialized in one of four critical-workforce-needs areas. 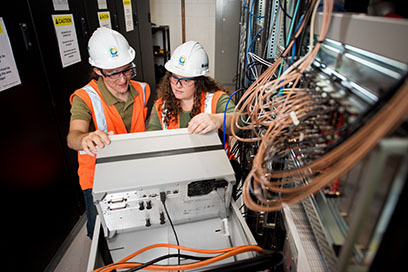 The Accelerator Science and Engineering curriculum will consist of courses, practical training at the Facility for Rare Isotope Beams at MSU and U.S. Department of Energy national laboratories, and thesis requirements.